The PV® Series, one of the most enduring loudspeaker enclosures from Peavey, is now powered with class D technology. 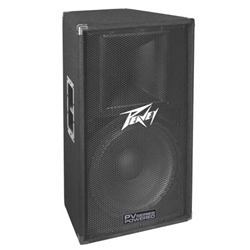 Peavey® proudly debuts the PV 115D, two lightweight and portable loudspeaker enclosures, utilizing Peavey's legendary loudspeaker and class D power amp technology to deliver unparalleled performance and value. A long tradition in sound reinforcement, the PV Series enclosures are housed in durable wooden, carpet-covered enclosures with a built-in pole mount. The new PV powered enclosures deliver 400 watts of bass-pounding, distortion-free sound utilizing Peavey's DDTTM compression.